Learn to make these brilliant brownies with our step-by-step guide below. Our caramel brownies will have everyone asking for the recipe, made extra special with Carnation Caramel – the ultimate secret ingredient! 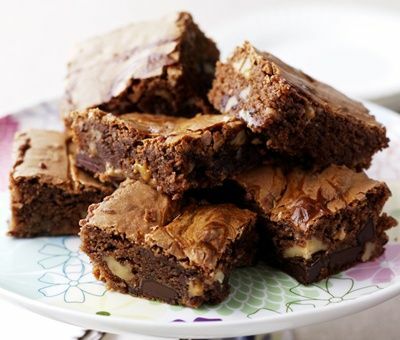 Bake our caramel brownies recipe in 30 minutes and indulge in these super tasty, gooey treats! 1. Preheat the oven to 180ºC (160°C for fan ovens) Gas Mark 4. 2. Melt the buttery baking spread with a quarter of the chocolate gently in the microwave. 4. Add the rest of the chocolate and the walnuts. Spoon into the tin. Beat the caramel in a small bowl and swirl into the mix. 5. Bake for about 30-35 minutes, they should still be sticky in the middle if you test with a knife! When cool cut into squares. Serve these delectable Carnation caramel brownies warm with a little more caramel for an extra treat! Recipe contains gluten, eggs, milk, nuts and soya. Hi can you use coco powder instead of chocolate? Hello Carla, using cocoa in place of chocolate will give a different texture and flavour. This recipe works great, no doubt will do this one again. I gave it five mins more in oven than recipe states.....perfect! Also used mixed chopped nuts instead of walnuts. really wanna try this but I dont think Carnation Caramel is already available in the Philippines :( I tried making one but it was soooo hard when its cooled! I made this earlier and followed the recipe to a tee, it looked lovely after 35 mins I took it out of the oven to cool and a few mins later I looked again and it had collapsed. What did I do wrong? Hi Trina, it could be that the brownies were not ready to come out of the oven. Always remember that different ovens will result in different cooking times. Cakes will usually shrink a it but it is important to ensure they are coked before removing. Hope you have better luck next time! Hi could anyone tell me can the carnation caramel be frozen? Hi Piper, We do not recommend keeping any of the tinned products in the fridge or freezer. However once it has been decanted it can be frozen. Have made these a couple of times, the first following the video recipe and the second time the recipe on the left, both are devine but the first has the edge for being sqidgy and dense! loved by all who shared them with me. thank you. watched video before trying recipe and order in which ingredients are added differs, also the eggs are only mixed with the sugar and not beaten until light and fluffy, does it matter which you follow? Hi Heather, the video shows how quick and easy the brownies can be to make. However if you have time its always better to whisk your eggs till light and fluffy it will be well worth the effort! I made this today for the first time as I had some carnation caramel left over after making Banoffee cupcakes from another recipe...I doubled the quantities as I had a bigger tray.. OMG amazing. Highly recommended. Hi Sarah, yes that's fine, its are really gentle method so ideal for melting chocolate. Thinking of making these.. Hmmm?? Hi Misbah, go on try them - warm or cold they are just divine!! I have just made this. It is very easy and came very very good! Caramel Swirl Chocolate Brownies Recipe is rated 5.0 out of 5 by 10. Rated 5 out of 5 by yellowkanga from Tastes amazing but doesn't make 20 the texture of this brownie is absolutely perfect. It's so easy to make too... I was making for 20 hungry lads so I doubled the recipe that should make 20, and it only made 17 decent size pieces. Unless you want the pieces to be the 'mini bite size' pieces that you can buy in a box from the supermarket, you will need to double this recipe - or triple it like I did. After making a double lot, I decided to make another lot and it's so easy I hardly needed the recipe and it was in the oven in 15 mins. The brownie tastes amazing, texture is perfect mix between sdodgy and chewy and it's so easy to make. 5star! Rated 5 out of 5 by Ritazee from Best brownie recipe This brownie recipe has become our house recipe - it gives delicious moist brownies which never fail to please. I am continuously asked for the recipe but only share it with special people ! Rated 5 out of 5 by Meryl from Fool proof I’ve used this recipe dozens of times, it is a real crowd pleaser. I have reduced the oven temp to 160 and cook for 10 mins longer. Rated 5 out of 5 by Gill57 from Great Brownie - NOT 20 pieces though Really good brownie recipe, very moist. I cut it into 9 pieces to get an average sized brownie. Will be my 'go to' recipe from now on. Rated 5 out of 5 by Nannashirlz from Loved by all I made these for my sons birthday. Since he was paying 20:00 to buy some well known ones. I don’t think they anything special so decided to make yours. Everyone loved them in fact was told to make double next time. Not even a crumb was left.